'Deadpool' (2016) Still. 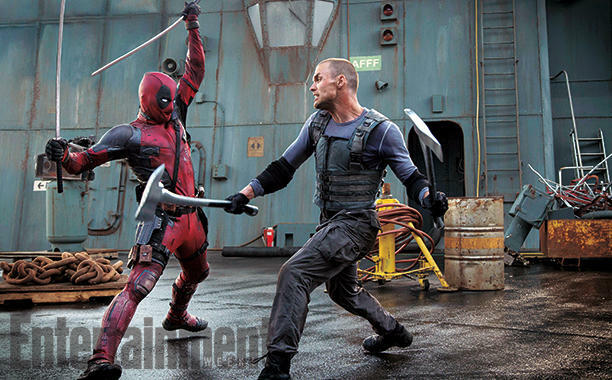 Still from 'Deadpool' (2016) featuring Ryan Reynolds as Deadpool and Ed Skein as Ajax.. Wallpaper and background images in the Deadpool (2016) club tagged: deadpool 2016 movie film wade wilson ryan reynolds ed skrein ajax still promotional photo empire magazine. This Deadpool (2016) photo contains hip boot and thigh boot. There might also be lippizan, lipizzan, lippizaner, lipizanos, lipizzaner, convention, camino de herradura, sendero de caballos, camino real, sello de la marina de guerra, sello, sello de marina de guerra, marina de guerra sello, and sello de.